The last empties post came from me right at the start of October. Since then a mound, albeit shamefully small, has formed of empty beauty, lifestyle and even food that I really need to get chatting about. So the title of this post is a little bit of a lie as it finds itself containing items from long before 2017 surfaced and when 2016 was merely drab not utterly horrific. As mentioned in a post in December I really want to get into using products up more again but as part of my 2017 aims I want to force less posts and therefore empties posts with reviews will come as and when there is time and a sensible number of products to discuss. Certain empties have stopped making the cut, such as the same toothpaste or underarm spray but should a different one come along I will be sure to throw it in, and with that there should be a bit more variety and interest when these posts do pop up; without further ado let us get into it. This stuff has appeared on my blog in the past but is likely to become much less of a feature as my tastes have shifted somewhat. With the fruit burst one being my favourite of the scents it is the one that I may continue to purchase as a back up for days when I want copious bubbles but have a poor sense of smell or nothing else available. During the last year of using it I have found myself becoming increasingly used to the scent and what used to be a fresh burst of fruit that lingered throughout the bath I barely even notice it as an initial burst but perhaps after several bottles of the stuff that should come as no surprise; give me the rhubarb scented bath product from Wilko’s any day of the week. The Oriental Breeze scent was neither here nor there and despite this bottle being the first time I used it there was only the most subtle floral scent there and certainly would not win any awards from transforming the bath into a garden of zen and relaxation. There may well be another bottle of this type in the cupboard though I am not sure on the scent and part of me will be pleased to work my way through it and see it leaving as it reminds me of a time of austerity and wanting bubbles without the guilt. I remember when this product came into my life and I was all in a muddle as my face needed urgent help and the answer was clearly (???) to buy a collection of insanely overpriced products. But initially it seemed to work and it really was the miracle that my skin needed but eventually it seemed to do less and it became too gentle for my ever changing skin needs. If asked I would not re-purchase this now and would instead opt for a Lush facial soap like coalface or recert back to a cheaper and gentle but more effective one; regardless the pricetag would not be quite so high for such a small amount of product. Some people refuse to try a fixing spray whilst others swear by one that is £20+ and cannot imagine any other especially one far cheaper working just as well. This one for £5 works well as the product itself really helps to seal the makeup in and help to prevent oil chaos occuring. During summer this stuff really helped to look after my face by keeping makeup in place and oil at bay but the more was used the more tricky it became as the pump and spray distribution is not too fantastic. I really want to get another setting spray, as I am currently lacking in one, but finding one that does as well at holding makeup and oil whilst also having a good spray when the bottle gets half used is a little tricky to find. If you have one that works well from start to finish and is not overly expensive, Fix+ does not work too well for me, then please do send suggestions my way. This stuff reminds me of bubblegum; it is bright blue, smells sugary and sweet as well as being rather sticky. It does not sound too pleasing does it? That would be because it is not that much of a pleasing product and had far more negatives than postive attributes. It seemed to leave a film on the skin whenever I used it whether it was on my legs or on my hand it never particulary left me feeling clean or fresh even after using another product to remove that feeling. But beyond that it was just a bit too slippery to really ever ensure it had a real grip on the skin to scrub it. Instead of using it on my body I found it much better on the top of my scalp as it is strong enough to be effective but soft enough to not be overly harsh. To do this I popped it onto my scalp, carefully rubbing it in, before doing shampoo as this allowed it to sit there for a couple of minutes and also ensure the sticky film did not remain. It is still not a wonder product, will not be on my list to purchase in the future and has put me off scrubs from Lush for the future (as the body shop ones are far better in my experience). This mascara in both waterproof and regular has worked wonders for me with its ability to not transfer, lengthen and add volume to lashes as well as not running down my face (waterproof or not!). In fact it is one of the few mascaras that does not transfer, regardless of what other makeup I am wearing, and given I have tested out a lot of mascaras in the last year of lower, similar and higher price points it really has me wondering what makes this one manage it when the others cannot. But this one can be tricky because of all its good points; it is an absolute nightmare to remove and even with makeup remover or a face wipe you will still find the odd bot clinging on or attempting to turn you into a panda afterwards. If somebody asked me what mascara I would recommend this would be it as it lengthens my naturally long lashes and helps to give them an enchanced curl whilst not transfering and being good from start to finish. Sadly I have a waste not want not attitude so have rather a lot of mascara to work through before being able to repurchase this one. These two packs came as part of a set of three with the first one being finished in the last empties post. Each pack had various qualities but none were standard out for quality to value and instead I found these agitated my skin (though I did not realise this until I stopped using them). They did not exfoliate or deep cleanse and instead aimlessly tried to collect the grime whilst not being overly damp or full of anything of particular note; you certainly could not rely on these to remove the above mentioned stubborn mascara! I love a good face mask and especially peel off ones but neither of these two types really hit the spot for me. Whilst the honey peel off one had good pulling power it did not feel enjoyable to apply due to amuch stickier than usual texture whilst also having a sickly sweet scent. It did peel reasonably but does not compare to cucumber cooling ones or passionfruit energising ones. As for the other one, an exfoliator and mask, it severely failed to miss the mark on either front and if anything I found my pores more clogged after using this product and giving my face a good scrub than I did without using any sort of mask at all. With Christmas just leaving us there are discounts on everything ‘naughty’ and people purchase you things as a gift and as a result the eating chart is not shining particularly in my favour these last few weeks. We could discuss those tortilla Pringles but honestly who has time for stale feeling and cheese flavour lacking Pringle wannabes; pass me an original Pringle any day of the week. In fact everything here is fairly mediocre with weird chewy orange bits finding their way into what could otherwise just be a well flavoured orange chocolate and whilst the Rowntrees tub was cool they were too much of a mixture to feel comforting combining as a handful. For me I intend to move on and forget about most of these products but if any of them are your favourites do let me know how they work for you! 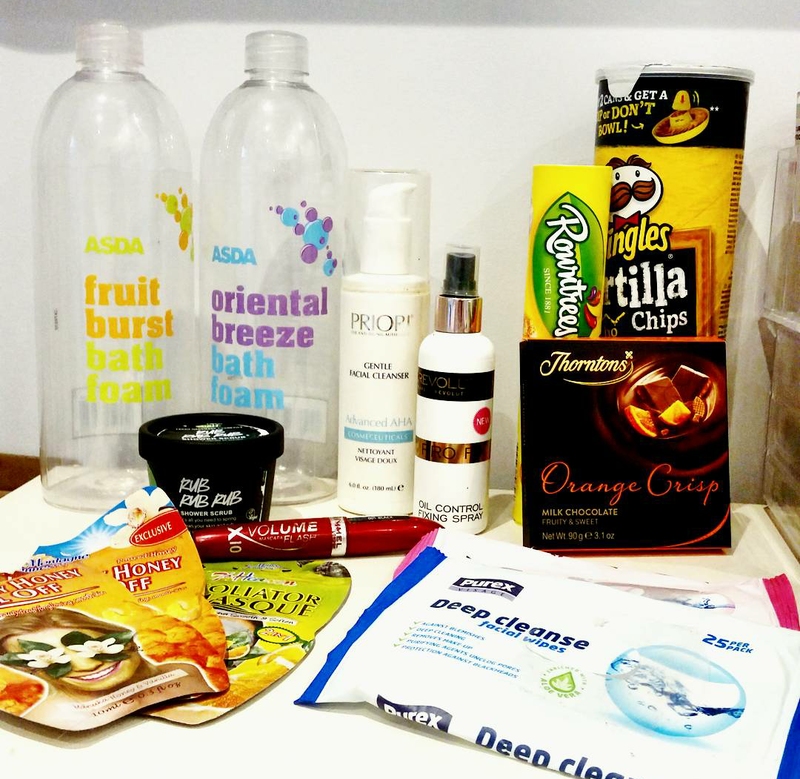 This entry was posted in Beauty, Declutter/Empties, Empties/Declutter, Food and Drink, Lifestyle, Product Reviews and tagged bblog, bblogger, bbloggers, Beauty, beauty blog, beauty blogger, beauty bloggers, body, bodycare, chips, crisps, declutter, empties, face, food, lblog, lblogger, lbloggers, life, lifestye blog, Lifestyle, lifestyle blogger, lifestyle bloggers, makeup, nails, pringles, project pan, savoury, skin, Skincare, sweet, sweets. Bookmark the permalink.